"Looks like the weather is going to be bad, I'm going up." October is tough on Sam Pyke. The 26-year-old Sisters-area hunter makes his living with a camera in the outdoors. I know, I keep him employed filming episodes of our TV show Frontier Unlimited. In between shoots, he hunts blacktails, the deer we call benchlegs. Any buck up there could likely be a cross between a blacktail and a mule deer. They are migratory, scarce and tough to get. When Pyke saw a low pressure system headed his way, he decided to head for the mountain. No one else could drop everything at short notice, so he headed up alone. A wet snow cast its blanket. Down on the trail though, the wind blew sleet and clouds rolled low through the tree tops. Pyke pushed on through most of five miles from the trailhead to try to make it to his regular camp site by dark. He reckoned he'd have thirty minutes to hunt before night fell. "Camp was about five minutes further on," Pyke said, when he reached one of his favorite spots to watch. He'd seen deer here before. He paused next to a pine tree and tried to make sense of the scene. Wind roared and tree limbs lashed back and forth in 40-mph gusts. "I think the deer were moving over to the east side because the weather was coming from the west," Pyke said later. A small doe appeared on the tree line, 35 yards away, then a fawn bounced by him. Visibility came and went with the puffs of cloud, down to 40 yards for a time then 200 yards. Pyke moved again, slower now. He started to think about building a fire when he got to camp and then he saw it. "A buck was laying at about 150 yards. He didn't see me." Between them was a log and Pyke walked straight to it and rested his rifle. He was afraid to shrug out of the pack, lest the extra movement alert the buck. In the scope, he counted antler points, three on one side, four on the other. Then he barked. It might not have worked with a blacktail, but it worked with this high country West-of-the-trail mule deer. The buck stood to his feet. Pyke took a breath, held the crosshair centered above the front leg, squeezed the trigger and saw the big deer crumple. 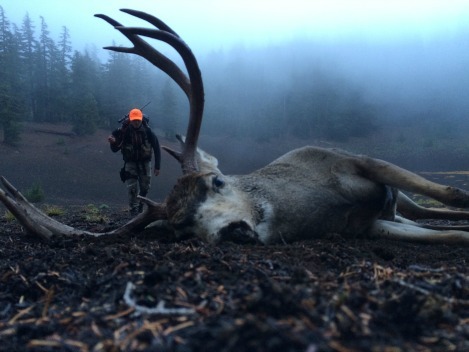 When he notched his tag and tied it to the antler, it was the third time in three years he had taken a buck in one of Oregon's toughest backcountry hunts. The common denominator was bad weather. In 2015, he made it four in a row. Pyke has hunted the area five seasons straight and learned a few things about the high country. "If you don’t get out in the weather, you’re losing eighty percent of the chance you’re going to get a nice buck," Pyke said. On his second year in the peaks, he shot his first buck, a forked horn. "That year it was rainy then sunny then rainy and windy." The deer were moving in the weather. "We learned to stay out till it's very dark, hunt all day, don't take breaks. Then we get out again before first light." Rather than watch large openings, Pyke prefers to sit in timber. "I listen for sticks to break, for hops, for bounces, for anything out of the normal. And I watch for dust in the air." He expects to see deer. Maybe not a whole deer, but part of the animal. "I look for bent legs and angles of antlers," he said. Sometimes those antlers are wet and when they're wet they shine. Opening weekend in the 2013 season the rain came in sheets. In eastern Oregon, the roads turned to gumbo and hunters that didn't leave got stuck. Trailers tipped over. Tents blew away. Up in the mountains, the storm brought snow. The day before the opener, Sam Pyke, his brother Eli and their friend Blake, started up away from the trailhead with their camp on their backs. They looked at the forecast, knew it was going to be nasty, but they also knew this was their only chance for the three of them to hunt together. As they started into the wind and the driving snow, one of them joked, "Wouldn't it be terrible if we all tagged out tomorrow and we each have to carry our own deer out?" They laughed. Throughout the long night the weather deteriorated. The bottom of Eli's tent filled up with rainwater. Snow and sleet found its way through seams. In the morning Sam headed to high ground. "I picked my spot because I could see pretty far down the slope on both sides. I posted up by a huge pine and watched and listened to the rain and looked for any kind of movement. It was hard because all the tree limbs were moving." Instead of looking for movement, he looked for what wasn't moving, something not blowing in the wind. "I don’t think deer are used to hunters up there. In bad weather they are pretty clueless." The ground was wet as a sodden sponge. As the sun came up, he could see a bit farther. Sixty yards away, he saw the fork of a shiny antler, very near the ground. Then the deer came out from behind the tree, with its head down. Pyke missed the first shot, but connected on the second. 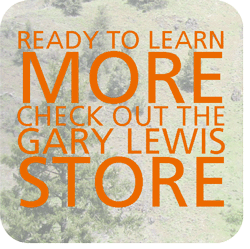 He tied his 2013 general season tag on a heavy-horned 3x3 with blacktail coloration and a strong mule deer influence in its face and ears. In the howl of the wind, Eli didn't hear his younger brother shoot, but he worked his way uphill and ran into Sam. After the congratulations, Eli walked away and walked right into a buck. Sam heard the boom of that shot and strolled down in time to see Eli tie his tag on a 3x3. As they both worked in the storm to put their bucks in game bags, they heard a shot in the distance. And another. And another. Blake had his first buck down. All three had filled their tags on opening day in the nastiest storm they may ever hunt in. "We thought that totally wasn't going to happen, but it did," Pyke said. Besides a bivy sack, a tent and a rifle, Pyke carries a tarp, freeze-dried meals, a water bladder, game bags, a stove, a compass and a lighter. In a chestpack, he carries more water, a headlamp, a beanie, gloves, snacks, a knife and his phone. "Go when you don’t want to," Pyke said. "That's what I learned." "Then be silent and hope to see the shape or shapes of a deer." On his solo 2014 hunt, Pyke weighed his pack when he arrived back home. On the five mile pack-out, he carried 30 pounds of gear and 66 pounds of deer on his back. On his solo 2015 hunt, he stayed as long as he could, feeling the hypothermia set in. He tagged a 3-point, cut it up in a driving rain and started back down the hill. "I think a guy has to realize there's a price to pay for hunting the wilderness," Pyke said. "It's going to hurt."